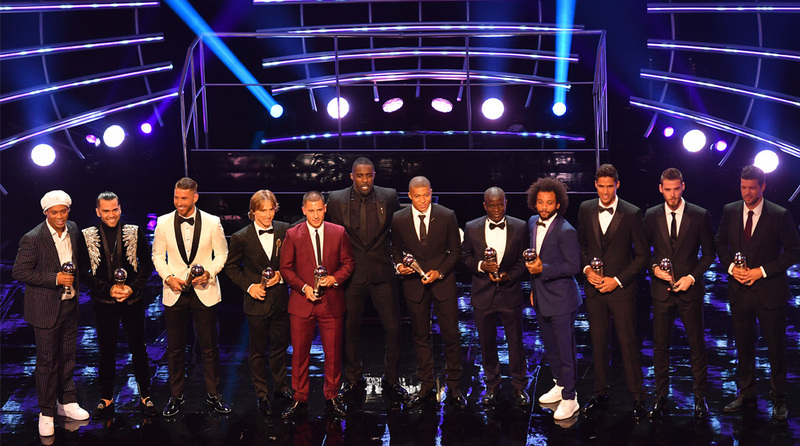 At a star-studded gala night in London on Monday night, the FIFA FIFPro World XI 2018 was announced, with some big names missing out while there were some questionable inclusions on the other hand to leave fans baffled. Spain and Manchester United custodian David de Gea, who was not in the three-man shortlist for The Best FIFA Goalkeeper award, made the XI ahead of Kasper Schmeichel, Hugo Lloris and Best FIFA Goalkeeper of the year—Thibaut Courtois. Veteran fullback Dani Alves starred for Paris Saint-Germain, but the Brazilian missed the 2018 FIFA World Cup due to injury and is yet to play a single game in the 2018/19 season, yet he was chosen at the right-back slot. Sergio Ramos and Raphael Varane, central defensive partners for European champions Real Madrid, were almost guaranteed a spot and the four-man defence was completed by their club teammate Marcelo. Traditionally, the FIFA FIFPro World XI has always been in a 4-3-3 formation and that’s why the midfield picks raised quite a few eyebrows as well. N’Golo Kante, who starred for France en route to their World Cup triumph and was largely outstanding for club Chelsea, anchors the midfield along with Croatian midfielder and Best FIFA Men’s Player —Luka Modric. It’s the third inclusion, however, that left many baffled as winger Eden Hazard slotted in a three-man midfield. The diminutive winger had a good season for club Chelsea and has begun the new campaign on a blistering note, while his World Cup exploits for Belgium piqued the interest of Real Madrid. However, it would be inconceivable to ever see the attacker play such a deep role in a football match and yet, the Blues man features in midfield. Up top, it’s the familiar duo of Lionel Messi and Cristiano Ronaldo and they are partnered by France and Paris Saint-Germain wonderkid Kylian Mbappe. Considering Mohamed Salah was shortlisted for the Best FIFA Men’s Player award, his absence is bewildering, as is Antoine Griezmann’s. Griezmann’s goals powered France to a World Cup title, while Salah was sensational for club Liverpool in the 2017/18 season, very nearly ensuring a UEFA Champions League crown. Messi was largely on fire for club Barcelona, but the Catalans flattered to deceive in continental competition and it’s widely agreed that he had a sub-par World Cup in Russia too. Full team: David De Gea; Dani Alves, Marcelo, Sergio Ramos, Raphael Varane; Eden Hazard, N’Golo Kante, Luka Modric; Cristiano Ronaldo, Kylian Mbappe, Lionel Messi.